Before you read on, please note that this post contains affiliate links, which means I could earn a small commission if you click and decide to buy. Wondering why Disciple Mama keeps her kids screen-free? 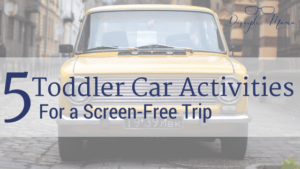 Check out this post on Screen-Free Parenting. Read. Read a lot. If you don’t have books, go to the library. If you do, make sure you’ve tried them all so you can find your favorites. When you’ve read the books enough, your child will be able to read them to you once in awhile, too. Switch it up! Oh, and check for books with audio cds at the library. They’re great for when you can’t/don’t want to read one. more. word. (Tip: if the content of a book doesn’t support your parenting goals in some way, ditch it. There are so many great (fiction and nonfiction) books out there; you don’t need to waste time on those that aren’t a positive influence.) Otis , by Loren Long, is one of my toddler’s current faves. Play outside. 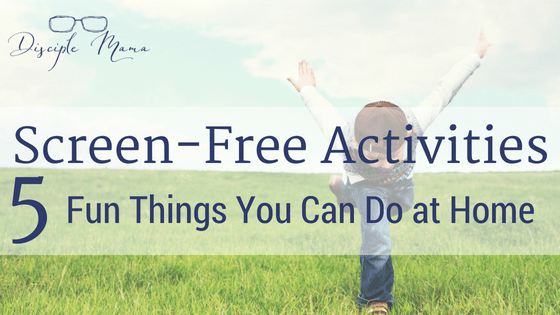 Get some vitamin D and fresh air, because who doesn’t need some of that goodness? Grab some sidewalk chalk and a bottle of bubbles if balls and bikes aren’t working for you. Learn about local flora and fauna and try identifying the flowers/birds/bugs in your neighborhood. Bust out the inflatable pool or improvise a water/sand/rice table. Do the stuff that’s too messy to do inside. Bonus: At our house, anyway, behavior problems decrease when we spend time outdoors. Music. Listen to it. Our record player is fascinating to our toddler. He’s kind of a vinyl snob, guys. You don’t have to have a record player, though. Break out your old cds or tapes and sing along! Music is a huge spiritual influence, and a great medium for memorization (think scripture or the alphabet). If you are not a sentimental collector of relics from your past (like me), you can fudge this one a little bit and use your phone to play the music. BUT, put it out of reach (of the kids, at least) while you’re listening. Make it. Get out the instruments! You know, the loud ones you sometimes wish you (or your loved ones) hadn’t thoughtfully provided for your child. E loves his Saxoflute ! Harmonicas, whistles, bells and tambourines all work. If you don’t have any, you can sing or play air instruments (E frequently uses a Lincoln log in the crook of his arm to play ‘violin’). We call this, “Family Orchestra,” and it’s no good while the baby’s sleeping. But if everyone’s awake, bring on the joyful noise! Play games. Games are super fun and so educational! 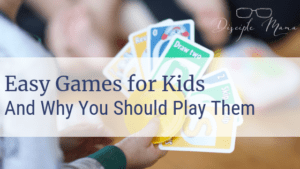 Very young children can play simple games to practice taking turns, counting (with most board games), and matching/categorization (with most card games). 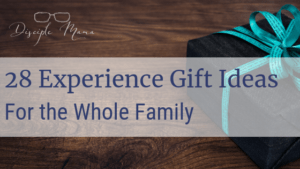 Playing easy games for kids is a fabulous relationship-building activity for the whole family. Don’t be afraid to make age appropriate modifications to the rules (fair is not always equal). Just don’t let the little ones win. Learning to lose gracefully is a skill best learned early and practiced often, in my humble opinion. Arts and crafts. I’m a little bit artistically challenged, so this is the area I struggle with the most. But, the good news is that play dough counts! Make your own or buy it, just make sure you give the kiddos some cool tools to use with it (plastic cookie cutters, etc.) and let them go to town while you accomplish things (or drink some lemonade). Is play dough too pedestrian for your tastes? Try Floof! Floof is as fun and fluffy as it sounds. E loves it! Coloring books or blank paper and crayons also work. Alternatively, you can do a more serious art project, but I have no good advice for that because I’m the worst at art projects. 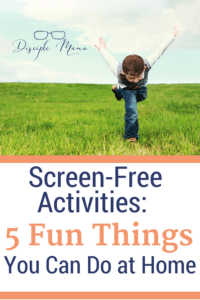 Whether you’re limiting screen time or quitting cold turkey, these screen-free activities will help get you headed in the right direction. If you’re lacking motivation, remember: every moment that your kids spend away from the tv, tablet, or phone is a moment that they’re spending more engaged with you, their siblings or friends, or their own thoughts. That means even a few extra minutes unplugged each day ultimately results in more tuned-in kiddos! Looking for something quieter? Check out these 5 quiet toddler activities from A Flourishing Rose! 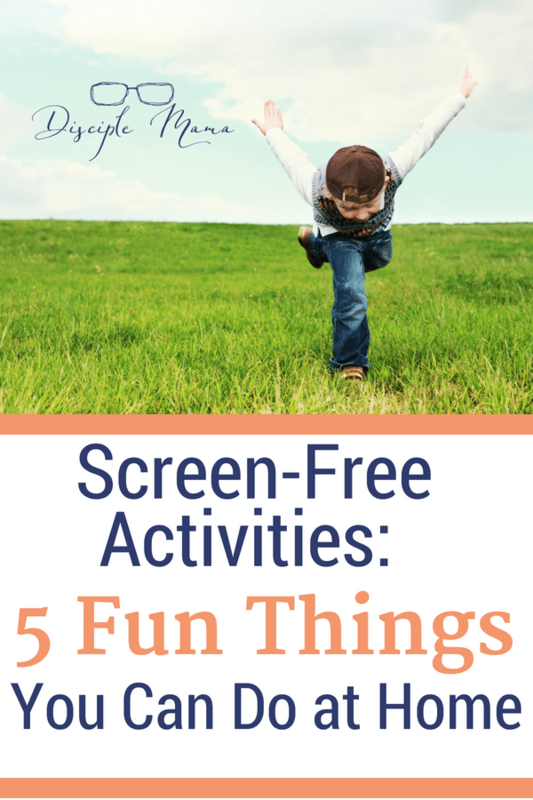 What are your kids’ favorite screen-free activities at home? Did you enjoy this post? Get others like it straight to your inbox when you sign up for the Disciple Mama newsletter!